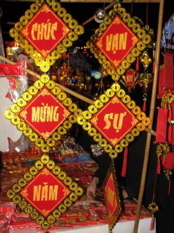 Tet – Lunar New Year in Viet Nam – is the most important festival tradition, observed by all Vietnamese, even those abroad. Every family in Viet Nam, whether they have money or not still tries to buy traditional goods such as flowers, sweets and square ricecakes for this special occasion. 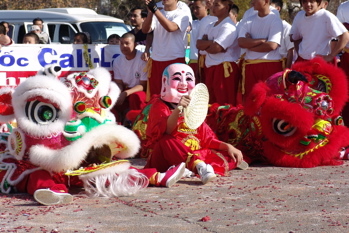 In my blog, I write that the western New Year festival is not the most important for the Vietnamese; the lunar New Year is the one that every Vietnamese celebrates. The preparation for Tet is chaotic, with shopping being the number one priority. Some Hanoians travel as far as Lang Son, on the Viet nam-China border for supplies where goods are dirt cheap and , of course, made in China. Virtual-Doug, an American blogger currently living in Hue, watches  as walls are painted and houses are cleaned in preparation for Tet. There is always a race on for builders to finish all construction work before the end of the year to ensure good luck for the occupants. For a Vietnamese like me, currently living away from home, seeing everyone preparing their houses, shopping for their children and themselves makes me happy with anticipation. The Vietnamese goverment has banned the use of fire crackers, which is sensible as the injury and death associated with them no longer occurs. However, the local authorities in the big cities do organise official fireworks displays which are attended by thousands of families who want to see in the New Year with a bang!